Summer traditionally begins on the 21st June, the summer solstice. The day when the earth’s axis is most inclined towards the sun, and therefore the day when we see the most hours of daylight. However, as we all know, in the British Isles, weather isn’t always that straightforward. Already this year, we have seen an exceptionally hot two week heatwave towards the end of May, which saw the majority of the country basking in temperatures that regularly reached to the mid-20s and over. Although we can guarantee some rain this summer, we should also see some other better patches in terms of heat. This fine weather is a great opportunity for our horses to get out and enjoy an adventure in the balmy temperatures. There are hidden ponds and lakes to be nosed at, woodland dells to be explored and meadows to be cantered across. You do need to be careful however, and that’s why we’ve put together a help list of how to look after your horse in hot weather conditions. …and in the summer months, you always should! As we all know, rehydration in hot weather is vital for pretty much every living creature. 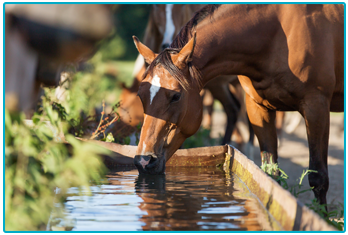 Ensure that your horse’s water is replenished at regular intervals. Bear in mind that troughs can be contaminated with algae and animal droppings, so make sure it is cleaned when you top it up. Also, just like humans, horses are different shapes in sizes, whilst some may be able to reach the water level in the trough, this may not be the same for all, so it could be helpful to double check. If you are planning on going out for a hack, then you should consider what time of day carefully. Early mornings and late evenings are likely to be cooler temperature-wise as well as being less intense in terms of the glare of the sun, and you should avoid going out in the middle of the day. If you are out and the sun feels particularly fierce, look for shade in which you and your horse can shelter. A horse’s skin is just as sensitive to prolonged exposure as a human’s. Apply a horse sunblock to any exposed areas, such as the nose or ears to prevent your horse from burning. In the hot weather, aftercare is just as important as preparation. If you have been hacking out in the hot weather, you’ll need to treat your horse carefully when you return. 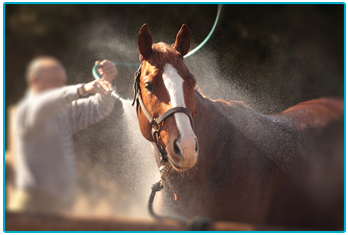 Remove bridles, saddles, girths and belly bands as soon as you return to allow your horse to cool off quickly. You can speed up the process by lowering their body temperature externally. Gently spray their flanks, legs and neck with water. Consider using electrolytes in the water trough to replace any salt lost in sweating. Like any human runner, this process can be vital for healthy recovery. Water is so vital in the hot weather that it can be easy to forget about another very important part of horse healthcare. An extended period of hot weather, or the last few weeks of the summer, can damage and deplete grass in the paddock or out in the countryside. The energy that food provides can be vital in allowing your horse to cool down. Make sure that your horse receives enough fodder, as well as natural foraging when you’re hacking out. Look for patches of lush greenery that your horse can snack on. As important as it is for your animal to exercise, in those heady days of summer consider keeping your horse in occasionally. On extremely hot days, hacking out or a day in the paddock can be more trouble than it’s worth. 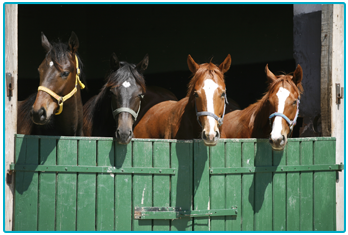 It can be difficult for horses to regulate their own temperature in these conditions, so look into stabling every now and then. When you do, make sure that the stable is cool and well-ventilated, and also free of flies that could bite and cause infection. If you use a fan to cool your animal, make sure it is out of the way of any water bucket or a curious horse’s mouth. Even despite our best precautions, your horse may still fall foul of some hot weather. If that’s the case then a trip to the vets can end being both expensive and emotionally upsetting. You may want to consider insurance in the event of such an event. At The Insurance Emporium, we offer flexible horse insurance, that you can Tweak with Elective Benefits such as Vet’s Fees up to £5,000 per incident. With up to 30% discount available, drop by today and find out how you and your horse could stay as cool as a cucumber!